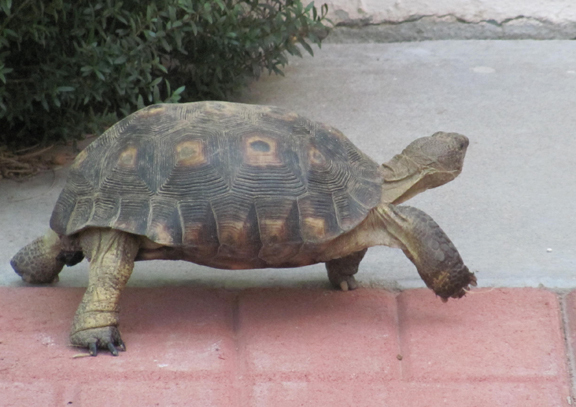 We’ve been talking about adopting a desert tortoise for some time. Todd’s Backyard would be the perfect home for one (there actually may be some here, but we’ve never seen them). We would also love the opportunity to expand the variety of natural desert dwellers. As fate would have it, we got our wish last night! After a botched attempt to meet up with friends for some Saturday night socializing…(we got lost in Tucson trying to find the party…aaggrrhhh), we sadly went back home to spend the evening pouting. Todd decided to go to Arbys to get some dinner. He returned, not with the medium roast beef sandwich I had expected. But, with a rather large tortoise! Apparently, on the way to Arbys, he found it sitting in the middle of a busy street. Since there wasn’t any natural desert around, Todd decided the best thing to do was bring it home, as it would surely get run over! So, meet the newest member of the family…. A beautiful, 20 something year old girl (I’m pretty sure) We are thinking about calling Arby! But, we are open to suggestions! 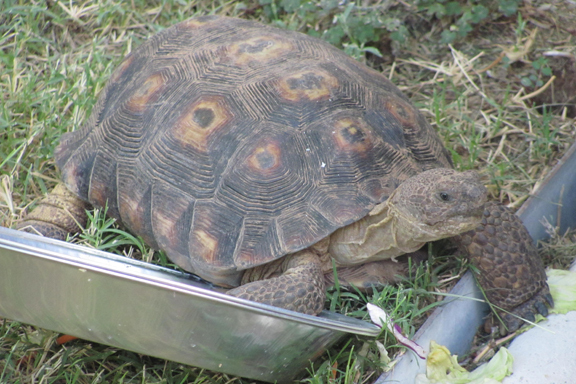 We put her in the ‘potty garden’ (a lush, fenced in area in the backyard) equipped with all the features required desert tortoise digs…Except a burrow- Today, Todd is building one and turning the area into a ‘fairytale’ tortoise habitat for her. For now, she is busy marching around her new yard, investigating her surroundings. Hopefully, she will be happy here! The dogs have met her…Cooper is scared of her. Baily and Lulu are like….’whatever’. They gave her a little sniff and went about their business. It’s going to be a learning experience, and is likely to be tortally cool adventure! 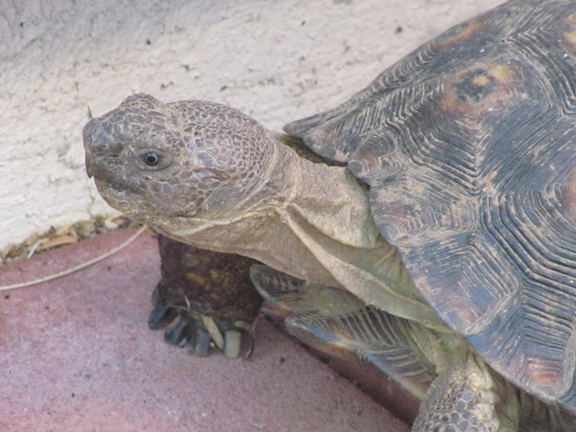 Love desert tortoises – they have such wonderful personalities! Enjoy your new family member! I vote for Arby, what else would you name her? Roast Beef? Super Size?